OK, I guess it’s not high on the list of very many people, and I admit I’ve never really thought a lot about what happens after I flush or run the garbage disposal, or when the washing machine empties itself, so long as everything disappears down the drain the way it’s supposed to. 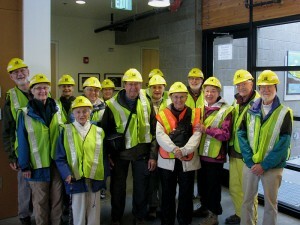 But when an opportunity arose for my hiking group to visit the Brightwater Treatment Facility, a joint project of King County (my county) and Snohomish County (north of mine), we accepted the invitation. Brightwater had been in the news for several years before it was finally completed. First the usual problems of where to put it–NIMBY–not in my backyard. Then there were construction problems, like when the high-tech European drill that was supposed to dig the long tunnel through which treated water would flow from the plant to Puget Sound broke down, and all the digging stopped while we waited for parts from Europe. Like that. But now the plant is almost complete, so complete that it’s open for tours, on Mondays for adult groups, by reservation, and during the rest of the week for school groups. So there we were, fourteen of us, decked out in yellow hard hats and bright green vests, gathered in the Environmental Education Community Center, ready to spend two hours walking, climbing stairs, and looking at pipes–lots of pipes, giant pipes, small pipes, white pipes, silver pipes and even purple pipes. Purple pipes are significant–they carry the reclaimed water that is 99% purified, used to water the extensive landscaping of the grounds and to flush the toilets, but not fit to drink. We learned about separating bio-solids from liquids, to make rich compost that is trucked to the wheat fields of Eastern Washington, and each of us received a small bag of compost to enrich our own gardens. We walked–fast–through the intake house where the fresh sewage comes into the plant, but that was the only place in the whole plant that was stinky. And no stink gets out! There are air cleaners that keep the bad smells inside. Outside the pipes and buildings there are acres of landscaping with paved walking paths and native plants. Artworks abound, especially in the Education Center, where we returned to turn in our vests and hats, and study the amazing art. The Art Plan for Brightwater was completed in 2003; a photographer began documenting the work, from demolition of structures to completion, in 2004. The art work was commissioned by 4Culture, the arts administration of King County. 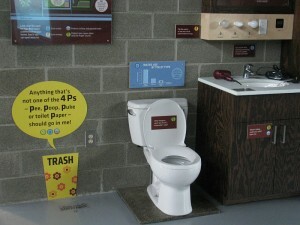 I can’t resist this last comment: our guide told us that the most popular exhibit for school children is this one: a toilet, with a sign that read, Any Thing That’s Not One of The Four P’s–Poop, Pee, Puke,or toilet Paper–Should Go Into Trash. It made us stop to think–don’t flush facial tissue! This entry was posted in Hiking, Urban Hiking, Winter Camping and Hiking and tagged Brightwater Treatment Facility, Natural resources, puke, reclaimed water, sewage treatment, Washington State, Woodenville WA. Bookmark the permalink.